Was this a feminist Super Bowl? OK, as a Seahawks fan, I’m not going to talk about the last 60 seconds of the big game. If I was a hockey fan, I might have enjoyed it, but it was just a sad ending to an exciting game. So end-zone battles not withstanding, how could the Super Bowl ever be viewed as “feminist”? It’s framed as a celebration of male violence that drives a billion dollar industry that promotes more violence as sport. The players are chewed up with the lure of big paychecks and the chance of not ending up with debilitating head injuries. This past year’s issues with players and domestic violence surely hasn’t helped the sport as a place where women can feel safe in the stands or on the couch. I can guess what Patricia Hill Collins thinks of the NFL, but plenty of 3rd wave feminists have made a case for football fandom. Now that Super Bowl 49 is in the can, how does it rate? Over 100 million people watched, so it’s important to look at the gendered messages. This year’s face-off between Seattle and New England had a lot of bright spots. The first thing is what was missing from the game. There was a serious absence of gratuitous shots of cheerleaders bumping and grinding for the cameras. I’m old enough to remember when the Dallas Cowboy Cheerleaders were the main attraction to the 1977 Super Bowl, setting the precedent for maximizing eye candy for male viewers. It’s clear that the NFL knows the female viewing audience is growing. Also missing was the annual cleavage-heavy Godaddy commercial. The King of Sexist ads, Carl’s Jr, had their sad entry pulled in many markets. 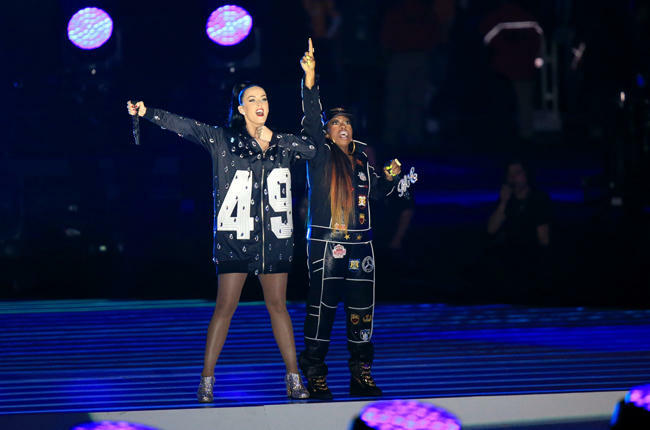 While the game was still dominated by male voices (I would love color commentary from Amy Poehler or Wanda Sykes), seeing Missy Elliot in the half time show, next to Katy Perry, was a welcome dose of serious femtasticness! The rap pioneer has been suffering from Graves Disease, so any moment we get to share with Ms. Misdemeanor should be cherished. So let’s talk about the ads, because unless you want to discuss who is cuter, Tom Brady or Russell Wilson, that’s the topic of the day. Aside from Kim Kardashian’s hips (they lie!) and a generic Victoria’s Secrets ad, there were plenty of rare feminist moments during the broadcast. Everyone’s talking about how depressing the ads were (Christ, don’t let a flatscreen TV fall on my daughter!). But the NoMore.org about ad about domestic violence was chilling and needed after this past year. I’m sure it was a tough moment at Ray Rice’s house. Or it was a bathroom break? Instead of endless Viagra commercials warning of about 4 hour erections (Please sir, may I have another? ), we got Always feminine pads with an important message, that when you use “like a girl” as a put-down, you are putting down all girls, including your sister. This add went viral on Facebook last year, but seeing it featured on such a massive media platform was like a breath of fresh air. On a summer’s eve. My personal campaign to get men to embrace feminism got a serious, if subtle, push in the ads as well. In a sport where there are lots of props for moms who raise players, often on their own, 2015 was the year of the dad. Toyota’s “Bold Dad” ad and Nissan’s take on “Cat’s In The Cradle” commercial, both celebrated father’s being present. Although anyone who knows the Harry Chapin song knows the tune does not end well for the father or the son. Fortunately for Nissan, the ad maxed out at 90 seconds, before the song’s sad climax. The prize winner in the dad category was the one for Dove Men. The company has done much around the issue of women’s body image in advertising but here we get a redefinition of masculinity. What makes a man stronger? the bit asks. The answer is not having a better car or winning an arm wrestling contest. The answer is simple and it’s not about power or oppressing others. It’s “showing he cares.” And after 30 seconds of images of dads being there, you believe it. There were other refreshing moments. Seeing Sarah Silverman and Chelsea Handler (T-Mobile) made us forget when Jerry Lewis said that female comedians can’t be funny. There was Mindy Kaling showing us that brown women can feel invisible (Nationwide) and Loctite Glue entertaining us with the most normal looking people ever. Even horrible McDonald’s sacrificed the production budget for a simple message of love and Jeep gave a shout-out to Mother Earth. There will be plenty of Monday morning quarterbacking. (“Why oh why didn’t Russell just give the ball to The Beast?”) But this year feminists were part of the conversation. Even the Portlandia feminists, who run the TV version of the very real feminist bookstore just down the street from me, were live tweeting during the game. Maybe someday there will be a female professional football league with a Super Bowl that will be nothing like Lingerie Bowl. Or at least an audience for women’s sports that rivals 100 million people on a winter afternoon. But, at the moment, we can take a NFL that now sees domestic violence as a serious problem, not something the sports heroes sometimes do, as a small victory. The voice of women has changed the game and there is a new standard emerging. The female senators who urged the NFL take a zero-tolerance stance on domestic violence are just part of that chorus. The country is realizing that girls and women love sports as much as the guys. It sort of makes me excited for Super Bowl 50. And no, I don’t want a Budweiser. I passively watched the game because as a taxpayer I paid for it (http://www.economics21.org/commentary/super-bowl-nfl-tax-subsidies-seahawks-patriots-nonprofit-01-29-2015). Thanks for the run down on the ads, it sounds like the Dove one is worth watching (I missed it). However, what I did catch was not very satisfying and much of it unsettling. My opinion on the rest was much more dismal. The theme of this Superbowl appeared to be hypocrisy. Jeep was the first runner up with an ad for imperialism playing over Woody Guthrie. Budweiser took third place dissing craft beer while gobbling them up at the same time, especially NW breweries (e.g. 10 Barrel, Elysian, etc). But the grand prize of the most hypocritical message is a tie between NBC and the NFL. On one hand we get an anti-domestic violence message which appears to be merely lip service based on the selective coverage of NBC. NBC refused to show a celebration of a player simulating a bowl movement, but gave us plenty of angles on how men solve their problems- with their fists (see the last minute of play). While there were many positive messages to women, the messages I received as man were downright shameful. It was interesting to see the development this year. It was a huge leap forward in terms of promoting and seeing healthy relationships between fathers and sons. What a great audience to market to. That made me so happy. Also loved the #runlikeagirl campaign ad as well. I really was disappointed that Katy Perry performed I Kissed a Girl as a straight song. Super disappointing to see her literally bow to that on.her.knees.